Pie oh my! How do I compare thee to a warm summer day? or a cool fall night? Any time of year, it seems pie is the perfect end to the meal … or maybe eaten a little after the meal, when we have the chance to savor the flavors on a belly less stressed by turkey dinner or a summer BBQ. Either way, it is the crème de la crème, the pièce de résistance! …and served à la mode, ooh la la! 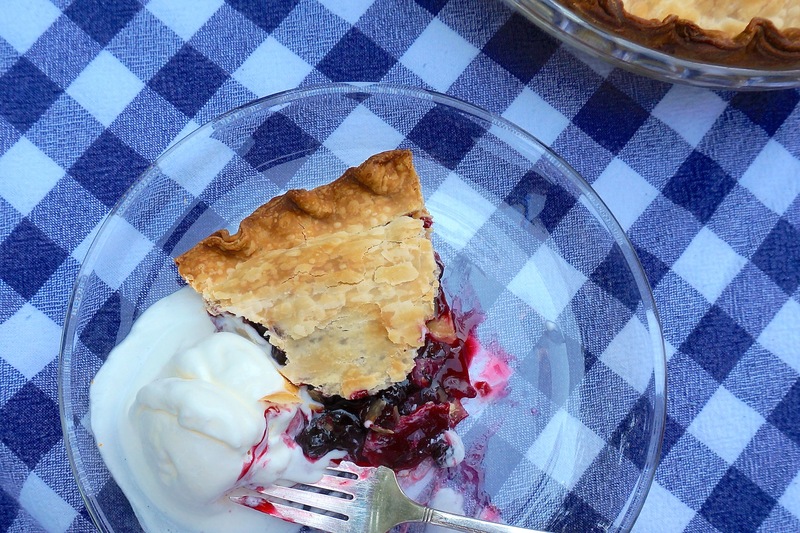 While I can eat pie all year long, there is something about a fresh summertime pie bursting with berries from the farmer’s market and a pie crust made with fresh flour and butter straight from the farm. OR you can just get a pre made pie crust and canned pie filling! I love spending all day in the kitchen creating a home made from scratch pie as much as the next guy. But when I’m pressed for time or looking for a quick dessert to bring to a potluck, I admit, I seek out that little Pillsbury dough boy to help me create it. 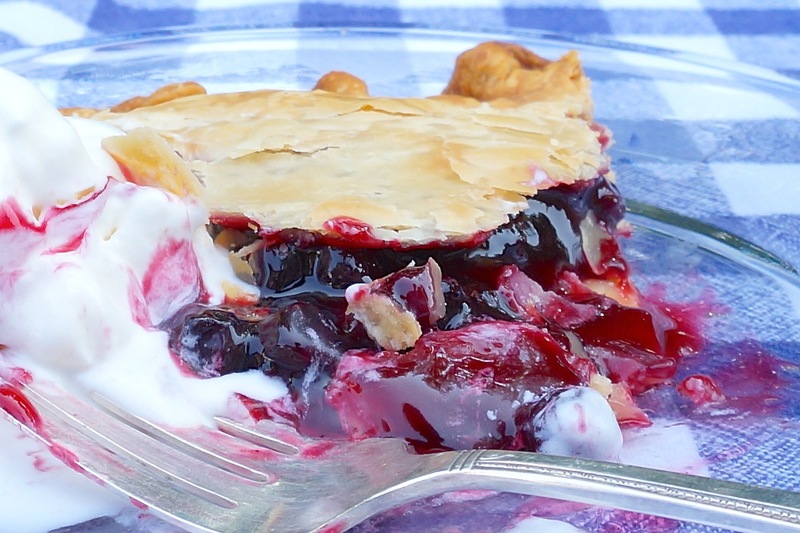 Pie crust in the freezer, filling in the pantry, badabing… in an hour you have a delicious dessert. Add a few touches to make it your own and you’ll be just like Sandra Lee! 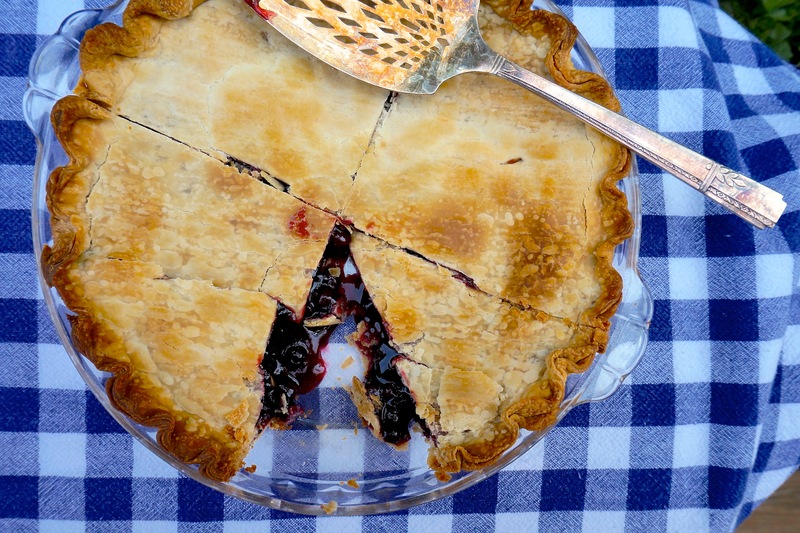 This particular pie is made from Saskatoon berries, those sweet little berries you can only get in Canada, dare I say, near Saskatoon! I remember as a kid driving out through the prairie to the Great Sand Dunes area and picking as many fresh berries as we could while running and falling and playing in those dunes. These days I can only have Saskatoon berries in Saskatchewan or in pie filling I can bring home to the U.S. 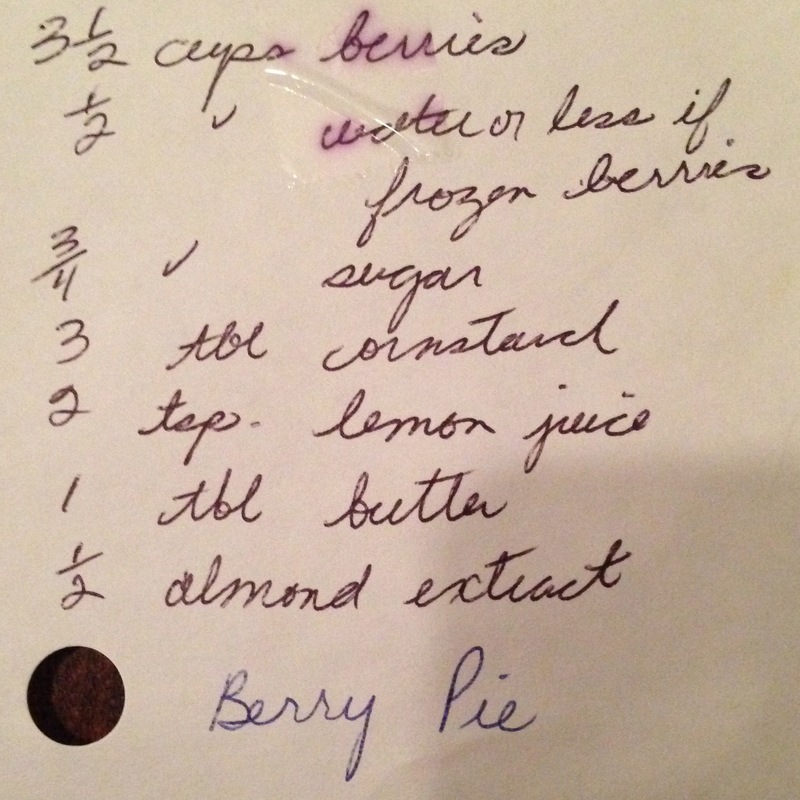 The recipe below includes instructions for fresh or canned. “Why go to all the trouble for these berries?”, you may ask, “Why not just use blueberries?” Maybe it’s the memory of childhood in Canada, or maybe it’s because I like the smaller berry with its unique flavor maybe a little more wild and tart than blueberries. But when I make it, I’m reminded of home and those carefree summers on the prairie. My father-in-law told me several years ago that Saskatoon berries are scientifically known as “amelanchier berries” and can grow in more parts of North America. The word, Saskatoon, is of Cree Indian etymology and was used to describe the berries of the province, so is the only way I’ve known them. The city of Saskatoon itself derives its name from the Cree extension then: “misâskwatôminiskâhk” meaning, “place of many Saskatoon berries”. How cool is that?! The only similar berries I have tasted in the U.S. are Maine blueberries, which I have learned are a variation sometimes called Juneberries. They tasted delicious but slightly more like a blueberry than the Saskatoons from Canada. It could be the strain or the location. I hope to try some out west some day, too! These berries can be prepared many ways (think jams, syrup), but with a pie filling created by the Berry Barn (a restaurant with one of the most beautiful settings in Saskatchewn), I can create my “homage au Canada” whenever I crave that taste. And of course, it needs home made vanilla ice cream à la mode! Preheat oven to 425F. 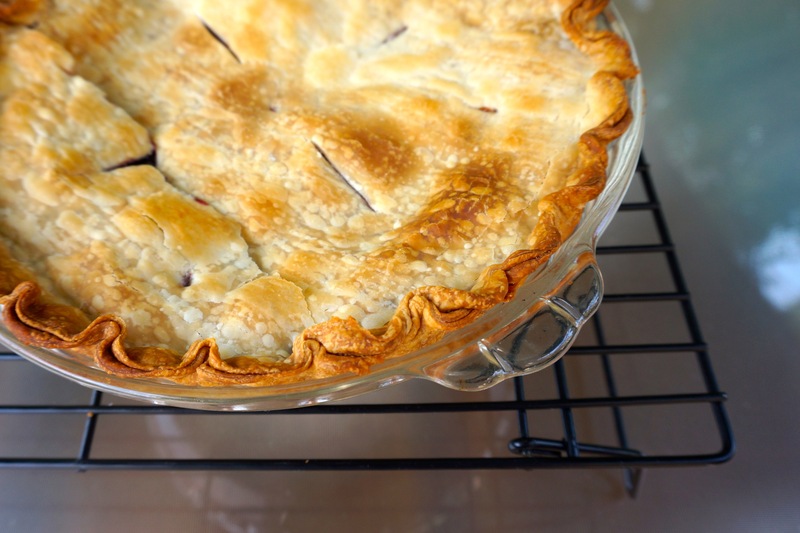 Bring crusts to room temperature, roll to size and place one crust in pie pan. For homemade filling, cook ingredients on stove until thickened. Pour filling into prepared pan. Cover with remaining pie crust. Bake at 425F for 20 minutes, and then cover rim with foil or metal pie rim protector, turn heat down to 400F and bake another 20-30 minutes.